In this post, we’re going to cover everything about music ornaments, what they are, how they’re used and how to write them. In architecture, ornamentation is used to decorate and give interest and character to a building. Think of the last cathedral you visited, how much of the ornamentation was necessary for it to function as a church? Not much, but it’s there to give interest and impress you with its decoration. In music, ornaments are used in much the same way. They’re not often essential to the melody of a piece but are used to “show off” and provide a different layer of musical complexity. There are lots of different types of ornaments that you’re likely to see when reading and playing music. Let’s start off by looking at turns. The symbol for a turn ornament is a curled S shape turned on its side and it sits above a note on the stave. Let’s start by looking at regular turns. First up we have a regular turn. 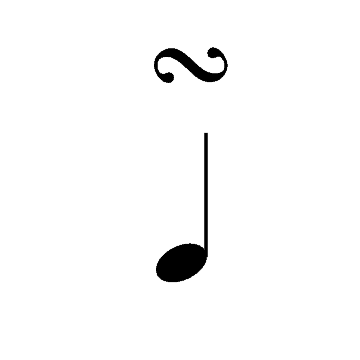 When you see this symbol it means that you should actually split the note into four different notes. So if we had a crotchet turn we would play four semiquavers starting with the one above the main note, the main note, then the note below followed by the last note which is the main note again. Next, we’re going to look at another type of turn called the inverted turn. There are two ways to write an inverted turn. Both mean the same thing. The way to write an inverted turn is just like a regular turn but with a line straight through the middle. The second way is to draw the turn upside down or ‘inverted’. Inverted turns start on the note below the main note, followed by the main note, then the note above, finishing on the original note again. Up next we have the mordent which is a short ornament that means you should quickly alternate between the main note and the note above or below. Let’s start by looking at an upper mordent. An upper mordent is made up of three notes, starting on the principal note, going up to the note above and then back to the principal note again. A lower mordent is almost exactly the same as an upper mordent but instead of alternating to the note above the principal note they go down to the note below. Lower mordents have a line straight through the middle of the wavy line (like an inverted turn). The way I remember the difference is that if it has a Line through it must be a Lower ornament. To see mordents in action this video of Bach’s French suite Sarabande shows lots of upper and lower mordents being used. A trill or ‘shake‘ symbol indicates that you should alternate between the given note (the principal note) and the note above it (the auxiliary note) quickly and repeatedly. It’s like a mordent but you alternate a lot more times. When it comes to writing and playing trills there are a few rules to follow but they depend on the context of the music that you’re playing. But that wasn’t always the case, in music written before around 1800 it was the convention to begin a trill on the note above the principal note. Because trills should always finish on the principal note it’s very common to add a triplet on the last notes. Sometimes trills will end with a turn going to the note below the principal note but it depends on the context of the music you’re playing as that will often determine which conventions you follow. There are so many pieces of amazing music using trills, but have a listen to this piece by Debussy which uses trills at the beginning extensively. The acciaccatura is also known as a ‘grace note‘ or a ‘crushed note‘ and is very common in lots of classical music. Acciaccaturas are to be played as quickly as possible before the main note they’re written in front of. Essentially they’re played as a demisemiquaver which is subtracted from the original value of the note it’s written in front of. To hear acciaccaturas in action take a listen to the beginning of this piece by Saint-Saëns – Carnival Of The Animals: Kangaroos. An appoggiatura is another type of grace note and is very similar to an acciaccatura. The difference between them is that it’s written without a line through its stem and tail. Generally, appoggiaturas are played one note above or below the main note they’re in front of. They should also be held for half the value of the principal note. As you can see in the example above, an appoggiatura in front of a minim should be played as if it were a crotchet. But, if you had an appoggiatura in front of a crotchet it would be played as if it were a quaver. One of the best pieces to look at when talking about ornaments is Chopin’s Nocturne in Eb major. It uses almost all of the ornaments we’ve looked at above. Try listening without looking at the score and see how many you can spot. That’s it for now, I’ll update this post soon with some more ornaments used in music and also how to modify ornaments with accidentals but if you have any questions just post a comment below.